As many of you know, I quit my PR job right before my wedding. I had some ideas about what I might do, and I’m happy to announce that I’ve made a decision — I’m going to open my own specialty paper boutique here in Omaha. It’s something I’ve wanted to do for a very long time but didn’t have to courage to attempt. But with the encouragement of my husband, family and friends, I’m now ready for the blood, sweat and tears it’s going to take to set up shop. In addition to writing about my experience opening up my stationery store here, I’ll be blogging about it on CraftStylish.com. Michaela, the managing editor, thought that the readers of CraftStylish would be interested in hearing about what it takes to launch your own business, and I’m excited to share the ups-and-downs with them. Not only will blogging help me stay focused on reaching my goals, it will enable me to bounce ideas off of incredibly creative people. I hope you will follow me on my adventure, too. I’m so excited! 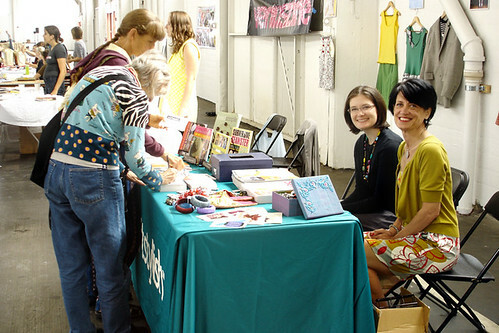 As many of you know, I was invited to San Francisco to help out at the CraftStylish booth. 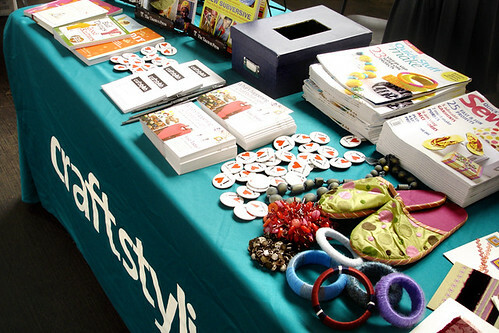 What is CraftStylish, you ask? CraftStylish is the ultimate resource for EVERYTHING crafty — from knitting to crocheting, sewing to quilting, jewelry making to paper crafts and more. The site is updated daily with patterns, projects and ideas to inspire novices and pros alike. Plus, they feature blog posts by contributors who are experts in their particular craft, like Susan Beal (jewelrymaking) and Jeffery Rudell (paper crafts). At the Renegade Craft Fair, the CraftStylish booth was giving away I Heart CraftStylish.com pins and encouraging crafters to register for the chance to win a Taunton Press book of their choice. By entering the raffle, they also received a free copy of either Quick Stuff to Make or Quick Stuff to Sew, special issue CraftStylish magazines. 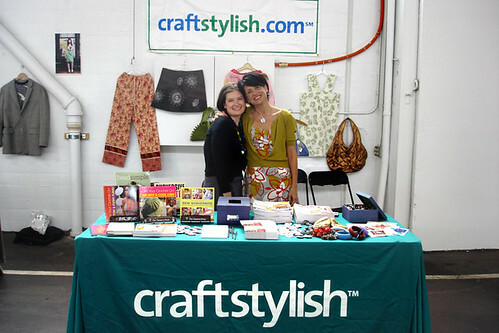 I had the best time hanging out with Jess (on the L) and Michaela (on the R), the managing editor of CraftStylish. Jess told me that I was going to love Michaela, and she was right! Michaela was so much fun and told THE best stories. Who knew that a conversation over dinner about plane crashes could be so entertaining? Thanks to everyone who stopped by the booth! It was a pleasure meeting all of you, and you totally inspired me to get my craft on! PS – Check out The Tote-ally Crafty Bag Challenge and enter to win a prize package worth over $250! The bigger news is that I don’t plan to jump back into work right after the wedding. I don’t want another cubicle job. I want a job that allows me to be creative, to work directly with other people, to make a difference in their lives. I’ve had some ideas as to what I might want to do floating around my mind for the last couple of years, but I’ve been afraid to pursue any of them. Fear of failure, maybe? But the wedding has been the impetus to get over my fear and find what I truly love to do. I’m starting a new life — a new husband, a new last name, a new extended family — so why not take a chance and start a new career. So what do I want to do? Be a wedding planner. Own a small stationery store. Go back to school. Open a franchise. Be a freelance writer. Be an interior designer. The truth is that I’m still in the discovery phase. I want to learn not only what I’m good at but also what I’m truly passionate about. I’m going to spend the summer networking (meeting wedding planners in the area, talking to small business owners) and researching (reading business books, perhaps seeing a career counselor). All I know is that I want to be happy. I want a job that I love and that challenges me. I want to work hard everyday. While I’ve enjoyed all of the jobs I’ve had since college (more or less), none of them were my dream job. While I’m still not sure what my dream job would be, I intend to start figuring it out this June. Have you found your calling? Are you doing what you love to do? Have you started your own business? If you have any advice or words of wisdom, please share! My new Kate Spade “Dara” glasses (they’re more brown than purple in real life). Apparently you can have 20/20 vision and still be farsighted. It’s the curse of cubicle dwelling–too much time sitting at the computer causes eyestrain (or is it fatigue?). I tried them for the first time yesterday and was amazed at how much sharper everything on my computer screen appeared. I’m kind of bummed that I have 20/20 vision now because I used to have 20/15. I enjoyed being hyper-normal. You are probably too excited about what’s ahead to get much work done today, but it really doesn’t matter. 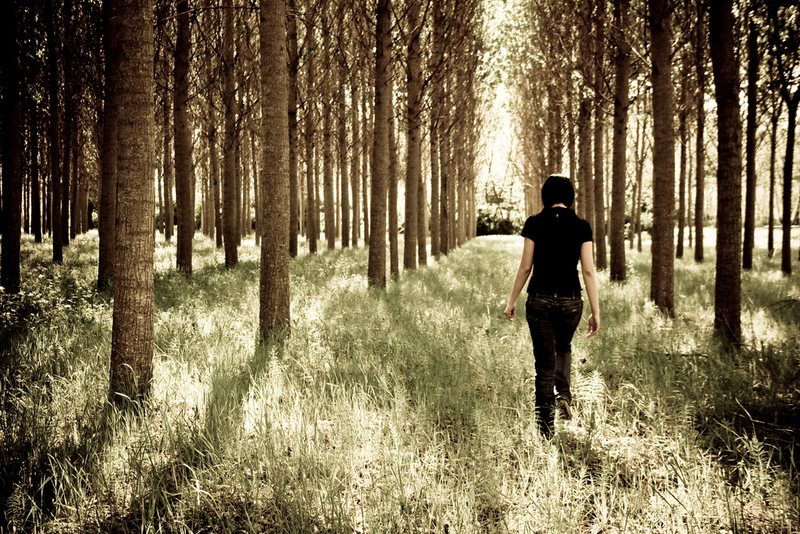 You still must do whatever it takes to meet your obligations, even if it means cutting back on pleasurable activities. Just don’t go overboard and cancel everything. If you settle down and focus on your work, you’ll have time left over for play. Too true! I am having THE hardest time concentrating on work today. I just learned that my photographer posted the 400 photos she took of J and I yesterday in NJ, and I can’t wait to go home to view them all! My office has a great little kitchen complete with a full-size refrigerator, dishwasher, sink and cabinet of mismatched plates, bowls and mugs. In the evening, someone loads all of the used cups and bowls from the day into the dishwasher and somebody else empties it in the morning. Several times a day, someone in the office makes a pot of coffee using Starbucks beans. 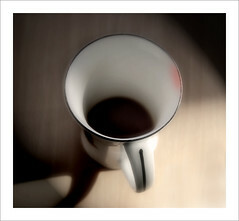 Every morning I grab a mug from the cabinet and pour myself a cup o’ joe. It’s a treat to not have to bother with programming my coffee machine at home or spending a couple of bucks every day for my a.m. caffeine jolt, which, as we all know, adds up over time. While all of the mugs go through the dishwasher before being reused, they don’t get scrubbed around the outside first. Nearly all of the mugs have a faint smudge of pink lipstick caked onto their edges. There aren’t very many people in the office who wear lipstick (I don’t), but I have yet to single out the culprit. One would think that this person would realize she’s staining the mugs and would either remove her lipstick before drinking or just apply it afterwards. 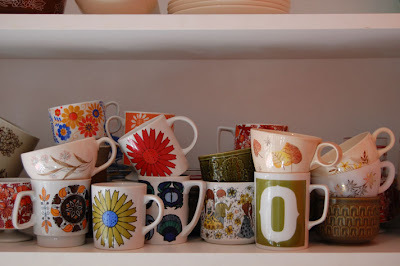 Obviously this doesn’t bother me enough to not use the company’s assortment of mugs, but after reading sfgirlbybay’s post on vintage mugs and cups, I think I’d like to get a couple of my own. I’d take care to hand wash them everyday (not that I’d get any lipstick stains on them), and I’d keep them at my desk where they’d be part functional, part decoration. how much sleep do you get? This article on KETV.com caught my eye this morning. Maybe because I only got 5 hours of sleep last night. NEW YORK — Dragging at work because of a lack of sleep? Join the club. A National Sleep Foundation survey of 1,000 people found participants average six hours and 40 minutes of sleep a night on weeknights, even though people estimated they’d need about 40 more minutes of sleep to be at their best. *About one-third said they’ve had fallen asleep or become very sleepy at work in the past month. Last week, the chairman of the Nuclear Regulatory Commission acknowledged it should have done more to investigate a tip that security guards routinely took naps while on the job at a Pennsylvania nuclear plant. Why so tired? The survey finds workdays are getting longer and time spent working from home averages close to four-and-a-half hours each week. People are trying to squeeze in more family time, too. The average wakeup time is 5:35 a.m. Average bedtime is 10:53 p.m.
*I’m always sleepy at work, and a couple of weeks ago, I think I fell asleep for five minutes at my desk. My problem is that I’m a night owl. Why? I have no idea. I just hate going to bed early. So how much sleep do you think you average during the week, and what time you do go to bed?